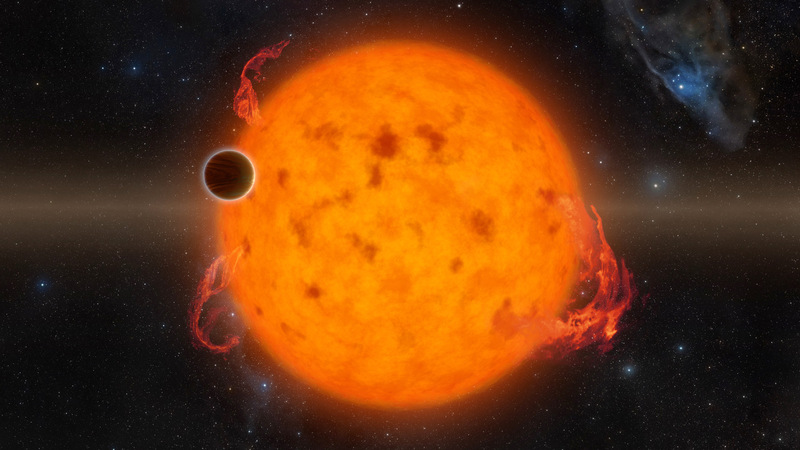 K2-33b, shown in this artist’s impression, is one of the youngest exoplanets detected to date. It makes a complete orbit around its star in about five days. These two characteristics combined provide exciting new directions for planet-formation theories. K2-33b could have formed on a farther out orbit and quickly migrated inward. Alternatively, it could have formed in situ. Image credit: NASA/JPL-Caltech. A team of astronomers has confirmed the existence of a young planet, only 11 million years old, that orbits very close to its star (at 0.05 astronomical units), with an orbital period of 5.4 days. Approximately five times the size of the Earth, the new planet is a “super-Neptune” and the youngest such planet known. The discovery lends unique insights into the origin of planetary system architectures. An enduring puzzle about exoplanets is their prevalence at orbital distances much closer to their central stars than the planets in our own solar system. How did they get there? One scenario holds that they were born and bred in the hot inner disc close to the star. Other scenarios propose that the close-in planet population originated in cooler climes, at distances beyond the orbit of the Earth, and migrated inward to where they now reside. Their migration may have been driven by interactions with either the natal disc, with other planets in the same planetary system, or with more distant stars. These scenarios can be tested observationally by searching for young planets and studying their orbits. If the close-in population formed in place or migrated in through interactions with the natal disc, they reach their final orbital distances early on and will be found close in at young ages. In comparison, migrating a planet inward through interactions with other planets or more distant stars is effective on much longer timescales. If the latter processes dominate, planets will not be found close to their stars when they are young. The new planet, which transits the star K2-33 in the 11 million year old Upper Scorpius stellar association, is one of the few planets known at such a young age and one of the best characterised. 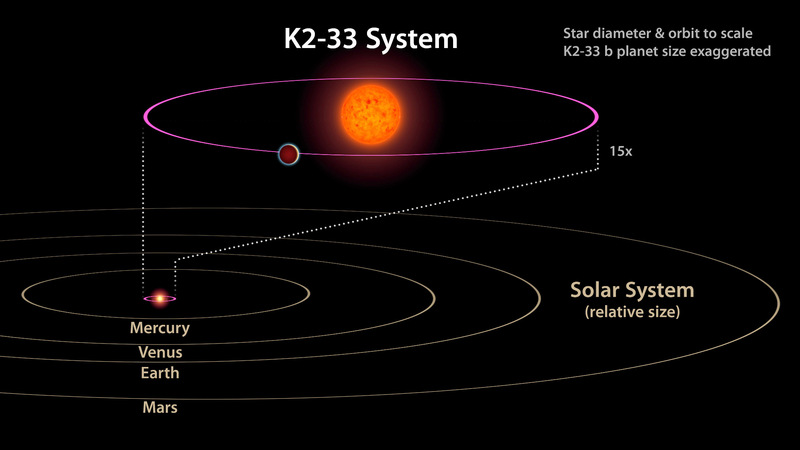 The existence of K2-33b demonstrates that some close-in planets achieve their final orbital distances early on. These planets either form close to the star or migrate there through interactions with the natal disc. The results are described in a study published in the Astronomical Journal. This image shows the K2-33 system, and its planet K2-33b, compared to our own solar system. The planet has a five-day orbit, whereas Mercury orbits our Sun in 88 days. 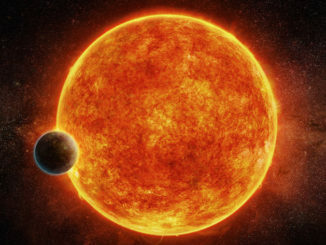 The planet is also nearly 10 times closer to its star than Mercury is to the Sun. Image credit: NASA/JPL-Caltech. 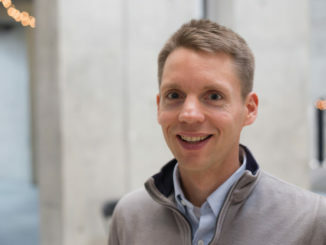 Andrew Mann (University of Texas at Austin), the first author of the study, is intrigued by these results, because how and when close-in planets achieve their orbital radii may affect the outcome of terrestrial planet formation. “If Jupiter or Neptune had migrated inward after the terrestrial planets formed, it seems unlikely that our solar system would have an Earth, or any of the terrestrial planets at all,” he speculated. Observations with ARCoIRIS, the new infrared spectrograph on the 4-metre Blanco telescope at the Cerro Tololo Inter-American Observatory CTIO, played a critical role in measuring the size of the planet. “Because the flux decrement measured during a transit constrains the ratio of the planet and stellar radii, a good measurement of the stellar radius is needed to infer the planet’s radius. 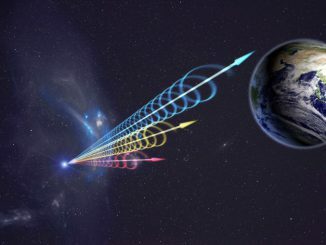 The ARCoIRIS spectrum measures the stellar luminosity and, thereby, the stellar radius,” explained NOAO astronomer David James, a co-author on the study. Additional high-resolution imaging and Doppler spectroscopy confirmed that the transiting object is not a stellar companion or a background eclipsing binary blended with the target. The high resolution imaging was carried out with NIRC2 on the Keck II telescope, and the Doppler spectroscopy with the Immersion Grating Infrared Spectrometer (IGRINS) on the 2.7-metre Harlan J. Smith telescope at UT Austin’s McDonald Observatory. Additional transits of the planet were observed with the MEarth arrays at the Whipple Observatory on Mount Hopkins, Arizona and at CTIO. In parallel with the work by Mann and colleagues, K2-33 was also studied by another research team led by Trevor David (Caltech), whose results are published in Nature. The two groups worked independently and reached similar conclusions.